Sunrise at 31st St. Harbor. Let's face it, a marina is a floating trailer park. Some folks may argue with this since you have the freedom to take your boat anywhere, boats are more of a recreational object than a trailer, some boats cost more than the collection of trailers in most parks, and boats are just cooler than a single-wide mobile home. 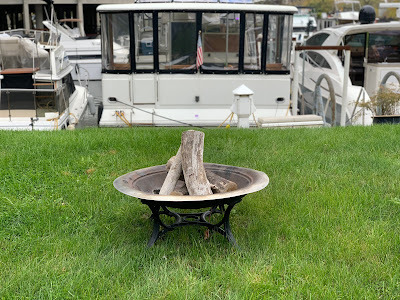 Maybe the analogy would be better to compare a marina to a campground, however campgrounds are designed for transient visitors with a small number of semi-permanent residents and most marinas are designed for semi-permanence with the ability to handle transient boaters too. Transient is the term used in the marine community to describe a boat or boater who isn't permanently staying in one place. When we took Cygnet to Michigan a couple summers ago we stayed in a transient slip which many marinas have available for people to stay a night or two. We've paid to stay at other harbors in Chicago as well, we've stayed in transient slips at Montrose, Burnham, and 31st St. River City doesn't have transient slips however we do occasionally see boats tied to the outside wall that we know are staying just the night while they move their vessels or are on the Great Loop. River City from the neighbor's house. Our side of the harbor. Under the building sleep many small boats. Our marina only has a handful of slips that are suitable for liveaboards, although there are a few people who live on small vessels under the building. That's not our style, we like sunshine and space so we have a larger boat in one of the big slips outside of the building. River City is also quite small as marinas go, only about sixty slips, and has almost no amenities. 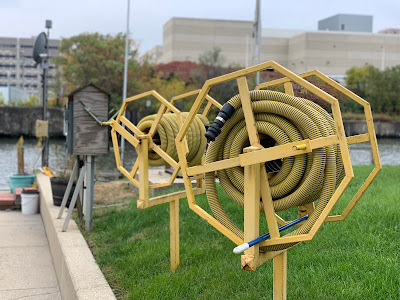 We do have a pumpout so we can empty the sewer tanks on our boat but that pump doesn't work just as much as it does work. Currently it has been out of commission for over a week and we have two full tanks that desperately need to be pumped out. Our management company doesn't do a great job of taking care of things. I'll also say that some of our fellow residents aren't great at letting the management company know about things that are broken so we're often the ones who have to make the call. It also is extremely frustrating that we as tenants of a privately owned slip are forbidden from contacting the management company. The owners of the slips are fined if renters contact the management company. Pretty fucked up. Our current slip owner is located 200 miles away in another time zone and hasn't been to River City more than a handful of times in 15 years so he has no clue what it's like day-to-day. Not a fault against him, just the reality of what we deal with. We send a text, wait a few hours, get a text back that he'll let management know about the issue and then we never hear if the issue was fixed. Our pumpout situation is extremely common, it fails way, way, way more than it should. This is the result of the management company choosing our old pal Jack Klompus to replace the pump a couple years ago. When you install the wrong equipment it fails. Again, it isn't just the management company at fault here, nobody who rents at River City is given any instruction on how to use the pump so many of the tenants mess things up. Kevin once helped a new tenant use the system after noticing he didn't flush the hose the first time he used it. Imagine a fifty foot long 2" hose full of black water being reeled up and what may come out. Oh the awful smell. Pumpout hoses and controls in the wooded "house." We also have a nice perk of a large grassy area (for Chicago) that we can use anytime we like. This will be going away soon since the management company let it get sold to the developer next door but for now we like to use it for parking bikes, having campfires, and hanging out. The management company did have a dispute with the lawn maintenance company this summer so it turned wild for a few months and we couldn't practically use it, but it's back under control now. Other than the rarely functioning pumpout and lawn we really don't have any other amenities to speak of. We do have internet but Kevin fought with the management company for a year to get it, plus he and a few other boaters had to pay for and install all the infrastructure to use it. Only the one side of the marina has it since it was Kevin that coordinated it and nobody else from other sections of the marina helped. Thankfully our friend Tim, who spent a winter at River City, knows a bit about wiring and building things so he custom built a pedestal to house the switcher and with the help of Mark we ran wiring to the power pedestals so each slip has a plug for their own routers. 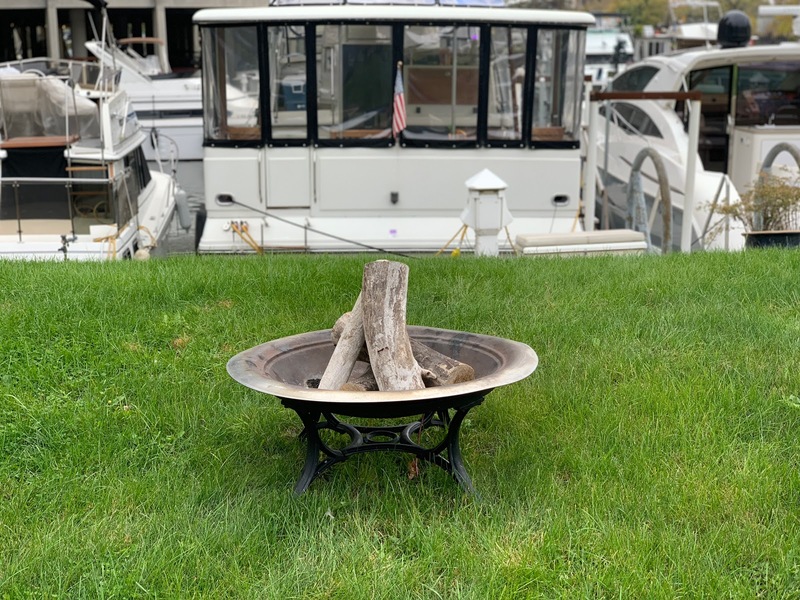 Our little fire pit sitting near Cygnet. Time to trim the grass. There are other marinas in Chicago with much better amenities, although some don't have many either, so we aren't too bad off. For example 31st St. Harbor has a bar, live music, a restaurant, a pool, gas, a pumpout, private bathrooms, showers, laundry, a ship-store, and a large public park and private indoor parking. It's a nice marina and we enjoy taking Cygnet there for weekends in the summertime, it's like a vacation all while staying home. The only issue with that harbor is the location, it's a bit remote by Chicago standards, in fact many of the harbors in Chicago are that way. Chicago's lakefront is for all intents and purposes a park. You need to get across the park and Lake Shore Drive to get to anything. Burnham Harbor is the worst since it is located on the Museum Campus, which can get flooded with tourists in the summer and often closes for special events. It can take 30 minutes to drive out of the marina, going only about 3/4 of a mile. Other marinas around the country also have great amenities and it's wonderful to be able to take advantage of them. What we like about River City is the fact that we walk off our boat and we're in the middle of the city. There are restaurants, shops, grocery stores, department stores, jazz and blues clubs, and almost everything we need within a few blocks. We put up with the difficulties of River City for the privilege of location. Living in a marina can also be a challenge because of other boaters. While we are sitting at home minding our own business other people are there to party. There are plenty of nights, and even some days, where boats near us are full of drunken revelers and loud music. This isn't meant as a "Get off my lawn" statement, we are sometimes that boat too, but it's something you need to live with. Occasionally you can be headed to bed after a long day and a neighboring vessel will return from a night on the water and they will keep the party going for a while, only feet from your bed. It's annoying and makes for a bad night's sleep, but it's part of the culture. It's something you have to live with. If you're a light sleeper buy good earplugs. Also you have the early risers. When Kevin was growing up his stepdad used to keep Two Wrights (we miss that boat!) in Racine and would often use it for fishing. If you have a fishing boat near you you can almost guarantee being awakened at the crack of dawn by the sound of big V8 engines crackling to life. Our bedroom is in the back of Cygnet and we've woken up to the sound and smell of big diesel engines from a neighbor's boat who's exhaust is basically pointing at our windows. Not a great way to wake up, but again it's something you have to deal with, especially since Cygnet is a loud boat and our port engine has a tendency to smoke a lot when first started. We've certainly woken people or kept them awake later than they like. We're sorry! The water at River City is pretty gross. Whether a marina is located in fresh or salt water there are many that you can swim in. A proper boater would never swim in a marina, it's not safe due to the possibility of electrocution from improperly installed or maintained shore power on boats, but sometimes it's nice to jump in. River City is on the Chicago River and the water is not really swimmable, sure you could take a dip but it's not recommended. The Chicago River is getting better, in fact some local city officials took a dip a while back to show how good its getting, but we're not that brave. Colette took an unexpected dip one day when we were docking Cygnet and she didn't stick the landing. She was fine after a shower but that's the only time either of us have jumped in at River City. This summer we spent a weekend at 31st St and after Kevin biked home from work on a hot day it was super refreshing to jump in the water and instantly cool off. Marinas with pools, beaches, or safe swimming water are really nice. Sunset at Montrose Harbor, Chicago. So water we thinking about marina life? Our marina could be amazing but because of blasé owners and poor management it has become little more than a wet parking lot. Some marinas are well managed and full of amenities but they don't offer the location that River City does. So for now we choose to stay put. 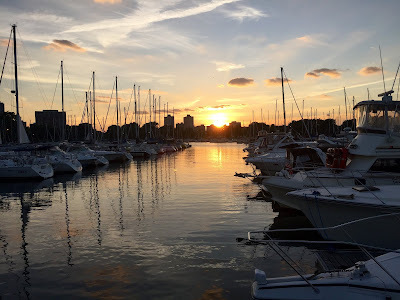 If you are looking at living aboard go spend some time at your marina and talk to other boaters to see what the culture is like and what you may have to deal with.